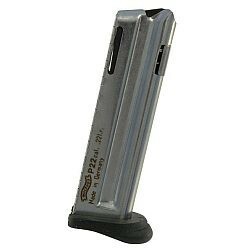 Factory replacement magazine for Walther's highly respected and innovative line of compact personal defense and sporting pistols are guaranteed for reliable fit and function. Steel construction and adherence to strict tolerances ensure years of service from these magazines with proper care by the end user. Features finger rest base pad that helps shooters to attain a more solid firing grip on smaller pistols that may be difficult for them to control otherwise.